This week marks our 4 year anniversary in our home (wow, that went fast!) and there's still so much that needs to be done! Since we're planning on starting (and hopefully finishing) some projects around the house this summer, I thought I'd share our progress with you all in a series of posts called: Around the House. I had originally thought we would have waited to move in until AFTER the inside of the house was painted. After living in the apartment much longer than we anticipated, we moved in mid-week after settlement. 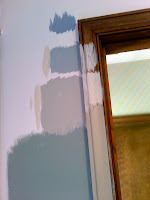 Choosing a paint color for the house was difficult. I'm so bad at making decisions. Really bad at making decisions. Then I saw Mrs. Woodward's kitchen painted in Restoration Hardware's Silver Sage and fell in love! I knew this was the color for our kitchen! 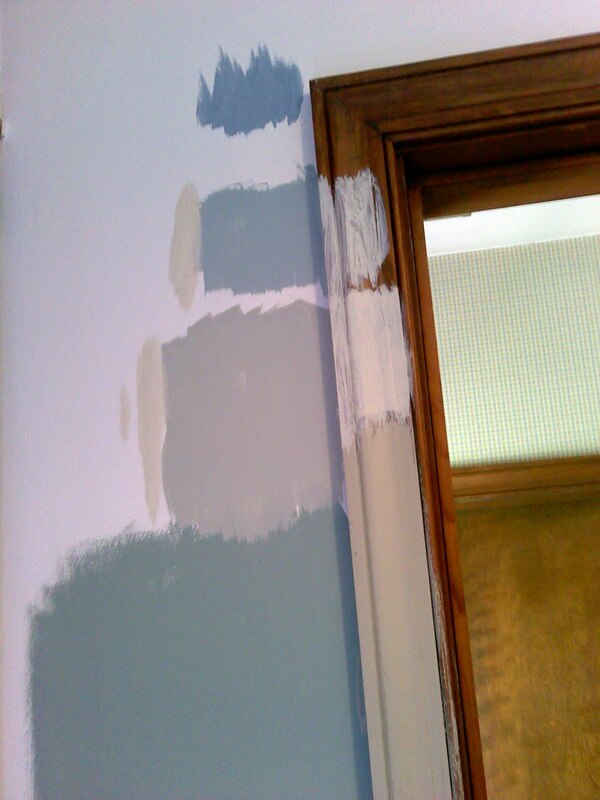 Now to choose a color for the rest of the house...and the trim. Joe and I took a trip to the mall to visit Restoration Hardware and picked up a bunch of little sample containters of all the colors I liked. Some wall colors and some trim colors. I knew that I wanted all the trim to be painted the same color. I figured that was the easiest best idea. After making several test marks on the trim in the kitchen, I decided that Eucalyptus (although, if you check out Restoration Hardware online, the color looks to be more grey than it looks in person...at least to me) would be the best choice for all the trim in the house. Since our kitchen is at the front of the house AND also the first room you see when you enter our home, Joe decided to start there first. Our kitchen was/is in bad shape. Remember how I said I thought the house was going to be painted right away? 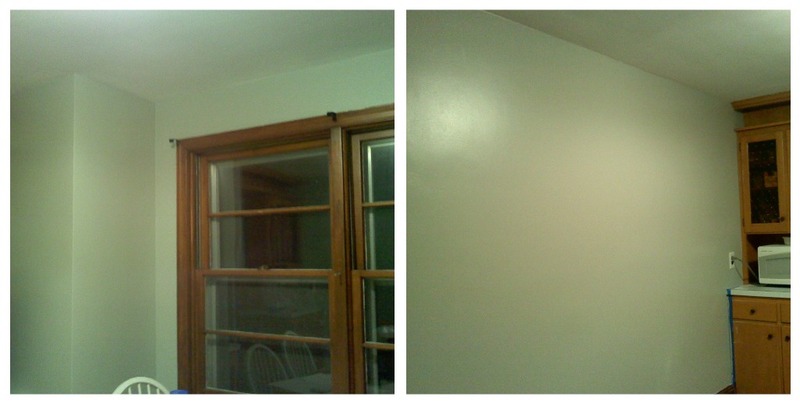 When we didn't paint before moving in, I thought it would be done in those first few months after we were settled in. So, I decided to let my nieces have some fun and paint the wall paper in the kitchen. After living with their artwork for a while, I tore it down. 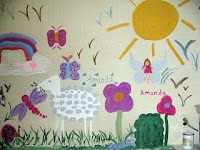 The dirty, ugly walls were worse than the too-vibrant mural the kids painted! I love how much better the kitchen looks after the walls have been painted! Sorry, the pictures really aren't great. I'll try to take some better photos soon. The trim isn't finished and the Silver Sage doesn't really match our turquoise counters and ugly old vintage wall oven, but the walls are clean and painted and I feel so much better! Next up on my Around the House series will be before and after pictures of our dining room. I'd love to hear about the home repairs or projects you'll be working on this summer! Share your project/s in the comments section! If you have a blog, feel free to post a link to your project! 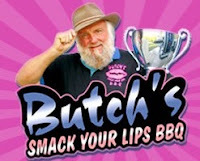 sponsored by Butch's Smack Your Lips BBQ! on June 13th, 2011 at 10:01 EST.